This is a stupid show. Intelligence mixes Chuck, The Bourne Legacy, and Person of Interest, but lacks the whimsy, the Jeremy Renner, and the high-concept inquiries of its source material. What it does have is a by-the-numbers plot, exposition in dialogue form, and a willingness to use what appears to be Canadian forests as a stand-in for India. 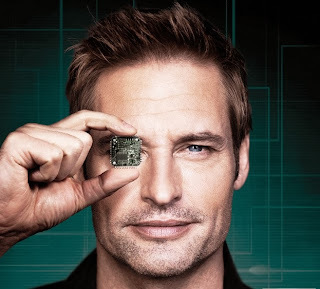 Josh Holloway (Lost) plays Gabriel, a former Delta force soldier with a chip implanted in his head that allows him to access “the information grid,” which includes satellite imagery, DMV databases, sealed juvenile records, and probably this website. (Hi, Josh Holloway!) Because he is a superstrong superspy, he is protected by Riley (Megan Ory of Once Upon a Time), a former Secret Service agent with a mysterious past: it’s her juvenile records that are up for grabs throughout the episode as a symbol of A) two-dimensional characterization, B) Gabriel’s phenomenal access, and C) the burgeoning friendship, which will inevitably become a romantic relationship, between Gabriel and Riley. Riley and Gabriel are part of the government’s cyber-center, which is apparently better run than FEMA yet less well-staffed than the local post office on tax day. Their boss is Lillian (Marg Helgenberger of CSI), who has the thankless task of pulling Gabriel off the case that has become “too personal” at the beginning of the third act. Despite the chip being not much cooler than an iPhone, Lillian also compares it to the Manhattan Project in terms of global and scientific significance. We all know that ended well. Intelligence does not address a single question raised or implied by its premise. We are meant to think it’s cute that Gabriel teases Riley about her sealed juvenile files; that is the stuff of my nightmares. (Not that I have a sealed juvenile file.) A super-strong soldier is given access to information that is meant to be private despite his characterization as reckless and insubordinate: we might as well have given the atom bomb to Peter Sellers. Intelligence has more in common with a video game—or some non-gamer’s idea of a video game—than Person of Interest, CBS’s actually interesting show about the intersection of intelligence both artificial and natural. It is the type of show in which a character jumps over an oncoming vehicle rather than going around, shortly after jumping through another vehicle rather than going around. One climatic scene involves a shoot-out in a paintball arena set to cheap techno; there are actual freeze-frames, and no I am not making that up. Another scene involved Holloway looking constipated while he accessed DMV records with his brain as a bunch of people sitting at computers watched him. It is so silly that it is boring. I didn't hate this as much as you did. In fact, I thought it was fun in an "I'll watch Josh Holloway for the next hour and see what he's up to" kind of way. Yes, there is a lot to improve, but I liked the story and I liked the characters introduced. I didn't see the twist in the middle coming and I liked the fact that said complication wasn't completely resolved in the first hour. My guess is that this is a show I will watch for a few weeks and then it will sit on my DVR for a while until, finally, one day I will delete all the unwatched episodes. In the meantime, Josh Holloway -- sigh. Yeah this show isn't very well-executed. I really wanna like it because I like Josh Holloway, and I'll stick it through a couple episodes to see if it gets better. I think there's potential for some really cool stuff with his "power". Like imagine him calling down an air raid while captured or something. Really if you think about it the chip makes him like Root without the...Rootness. The shootout in the paintball part was very similar to Reese and Root's God Mode. Personally I never got into Chuck and always wanted a more serious show with a similar idea. This could be that show for me. My gripes are fewer than yours Josie but they're there. Similar to you, so far the chip doesn't seem to do that much. Like I can see the possibilities but the episode should've put something in that really emphasized the danger of it. Heck, maybe even put a downside, like it makes his metabolism ludicrously fast so he needs to stay caloried up at more than regular intervals. So far Riley seems incredibly useless and/or pointless. Gabriel noticed the sniper and was going to duck, she shoves him to the ground. Gabriel had his gun trained on the thugs, she shoves him out of the way, cuts down their offense by half, and gets herself shot. She gets herself taken hostage. She's supposed to keep him in line but she's already indicated that she's gonna help him find his wife. I'd like more of a reason as to why a seemingly loose cannon like Gabriel was given the chip besides him having that rare gene. To be fair about the "going around the vehicles" part. Jumping through the little buggy was actually the more effective method, because it was the quicker route (think parkour) and it allowed him to get the quick drop on the alert guard. Going over the other vehicle was safer because there's always the risk of smacking right into a door if you're going around. Which happens a lot in TV and movies, usually to villains though. Riskier, but it also emphasized the physicality of Gabriel. I can't remember if the episode said exactly where that base in India was, but I'm guessing it was supposed to be someplace like The Himalayas or something. I don't really know how the trees would look there but there's certainly snow on the mountains of India. But yeah, weak start, but I reckon it could be ironed out. But... but... but... Josh Holloway! We recorded this last night because Josh Holloway! (Plus we're fond of Meghan Ory.) But I've not been looking forward to it since I saw the trailers. And since the reviews started coming in, I've been even less excited about it. Erg. I suspect this will quickly become a test of how long I can watch a show I don't like even if I adore the lead actor. That is such a "mileage varies" thing for me, Jess. I am about to give up on Almost Human even though Karl Urban is a big favorite of mine. But nine years ago I kept watching Supernatural because of Jensen Ackles, and you could say that paid off for me big time. I was completely zoning out on some of the early Almost Human episodes because they were too "basic cop procedural" for me. Been there, done that. But I've liked some of the more recent offerings a bit better. They've upped the sci-fi nature of the cases, and I'm finding it generally more engaging. And the hubby and I are enjoying the dynamic between Kennex and Dorian. It could certainly be better, but we're reasonably entertained by what they are giving us now. Of course, it also helps that it doesn't really feel like a long-term commitment, given the ratings. We can just enjoy it while it's around, then move on. The common theme in all these comments is our love for Josh Holloway. We are not alone. Benefiting from its NCIS lead-in, the numbers were so good that TVLine is calling it "this TV season's most watched series launch." Finally saw it (busy week) and I actually rather liked it. Josh Holloway had my heart for six years and it's hard to break a habit like that -- I just liked him and wanted to watch him, no matter what he did. I liked Meghan Ory, too. She kept up with him, and that's no small thing. There was indeed a lot of predictability and cookie cutter scenes and awkward exposition, and things could certainly get a lot better. But I think I'm ready to stick with it for awhile. If it turns out to be a cop procedural with a sci-fi twist, like Chris said, eventually it will start piling up unwatched on my DVR and that'll be it. Just one small geeky comment. How cool was it that they included two Star Trek alumni as supporting characters? (Rosalind Chao from DS9, John Billingsley from Enterprise.) And they could actually end up hanging around, too. Maybe we ought to start compiling our own Doux Reviews glossary. "Spoiler kitten". "Holloway Curve". What else?